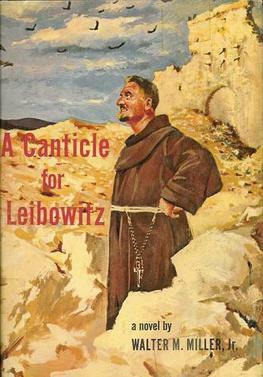 This novel describes a post-apocalyptic future through three vignettes involving the Brothers of St. Leibowitz. "Fiat Lux" (let there be light), is set during an period obviously modeled on the renaissance. Science & Technology are being rediscovered at a quick pace. The libraries of the Brothers at St. Leibowitz are crucial since they have been copying blueprints from the time before the fall. Along with these discoveries, however, questions emerge. As humans achieve greater things, and obtain more power, who should control the information? the state? scientists? And what is the relationship of the divine with these new discoveries and creations. "Fiat Voluntuas Tua" (they will be done), brings the cycle full circle. The world is either what we would consider moderns, or near future. The Abbey at St. Leibowitz is divided between a glass and steel research institution and the old "Medieval" house of worship. A unique facet of this section are the "press conferences" that sometimes get inserted between chapters (implying advanced communication tech), that update the reader on "current" global events. This final act deals with humanity struggle to deal with the world it has create. This is played out on the geopolitical, social, and individual level, for a satisfying, if depressing, conclusion. The three parts are styilistically and thematically distinct. "Fiat Homo" has a slow moving mystical quality to it. "Fiat Lux" is faster paced, and giving a sense of progress. "Fiat Voluntuas Tua" is almost chaotic. The three work well together to tell the story of an entire epoch. Emergence, growth, and culmination are played out in a grand tune that tells of hope, courage, cowardice, and ultimately, destruction. Note, previously I said I would write about all the books I remembered reading. Scrapping that. Grad school and work shut me down pretty hard last month, and I wanted to get this out before march rolled around.